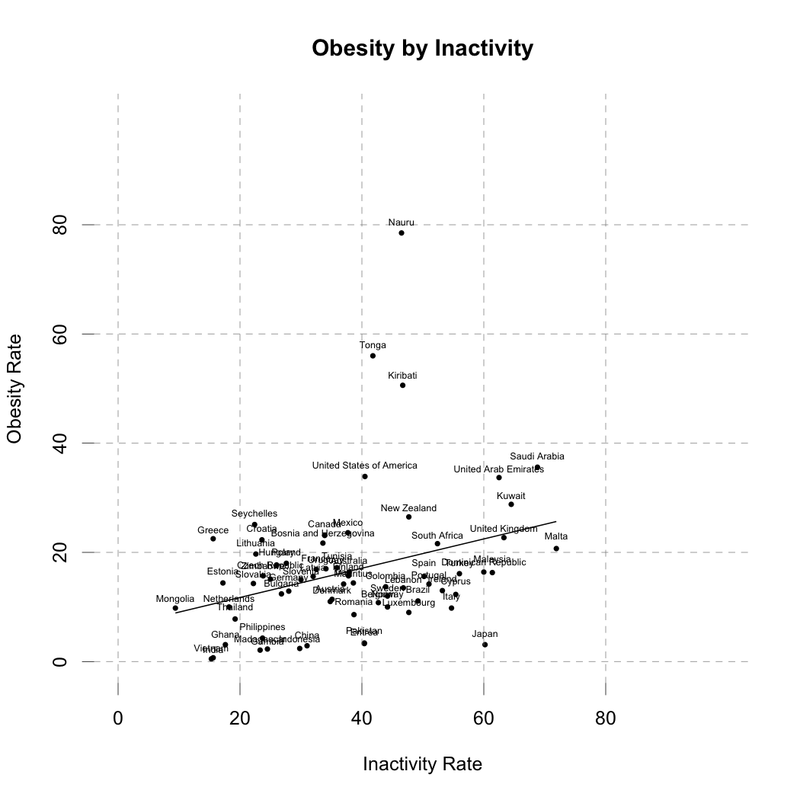 The other day, the Economist published a chart in one of its blogs showing a map of inactivity rates by countries. The data is based on a study published in the Lancet, where inactivity is defined as less than 30 minutes of moderate-intense activity five times a week, or 20 minutes of vigorous-intensity activity three times a week, or a combination of both. Argue all you want with the definition, but I was really curious to see how that correlated to obesity rates by countries. So I looked at it. If you click on that you'll be taken to a magical place where you can hover over dots and see countries and relevant statistics. Some countries are missing either due to poor merging on my part or absence in one source or the other. 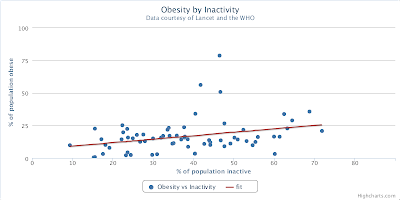 And while this doesn't actually mean anything, the y-intercept of the line is at 6.4; even if inactivity rates were 0, we'd still see a population obesity rate of 6.4. Assuming, of course, that extrapolation of naively-simplistic models based on methodologically questionable data can be trusted. And why not? It worked at LTCM and Washington Mutual and Bear Stearns. 1. Not percent, percentage points, don't even get me started on that terminology here. 2. Get it? Fuller? Filled out? Because we're talking about obesity?! Because fuller is what you say when someone is fa...okay, I get it, this is not funny. 3. I'd like to thank Highcharts and R for their awesomeness, the Economist for being the best news publication in the history of the universe, and the WHO and the Lancet for not suing me for borrowing data. Way to go Japan. Ruining it for everyone. But really, I bet if we saw an average daily caloric intake we'd see a much higher correlation. 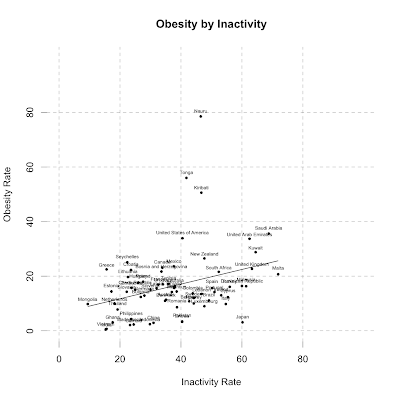 Or if we took caloric intake and subtracted activity rate * avg calories burned (and some units magic I'm hand waving over), and plotted that against obesity, we'd see some really high correlation. Also I'm pretending to remember any stats lingo. Were you this interesting before you got married too? This is disturbing in weight/wait of the up- coming "feast". The American Council on Exercise ACE, says that we consume on average 3000-4500 calories on that day (including 229 g of fat!). Perhaps we should "enlarge" your linear model to exclude the holiday...so that this fatherly model won't be BMIed out? Just saying..
Get a birth control prescription. Oral contraceptives are the most common type of treatment for polycystic ovarian disease. The pill helps balance hormone levels and regulates the menstrual cycle. Thus, sufferers enjoy shorter and lighter periods. Thanks.